Lakme's new offering, Lakme Lip Love Lip Care is a range of dual core lip balms, the first of its kind in India! Lakme Lip Love Lip Care is a little tint with lots of lip care. You can keep your lips moisturized and protected with a combination of a nourishing core along with a hint of tint and SPF 15. Lakme Lip Love Lip Care is available in 12shades: cherry, strawberry, raspberry, grape, cocoa, peach, tangerine, blackberry, apricot, mango, watermelon and vanilla. 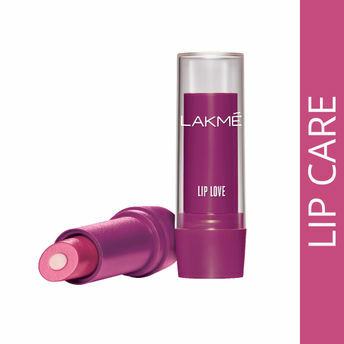 Pick the Lakme Lip Love Lip Care of your choice, today at just Rs.200! Lakme Lip Love Lip Care comes packed with a lot of features: Dual core lip balms that tint your lips and protects them, It's lusciously creamy core and SPF- 15 keeps your lips moisturized and sun-protected, Creamy texture that glides easily onto your lips, Available in 10 fun shades, Best suited for everyday use. Lakme Lip Love Lip Care is your daily essential which is easy to carry. It can be paired well with Lakme Eyeconic Kajal and CC cream to get the complete look. Explore the entire range of Lip Balm available on Nykaa. Shop more Lakme products here.You can browse through the complete world of Lakme Lip Balm .Alternatively, you can also find many more products from the Lakme Lip Love Lip Care range.